How did I end up literally in the middle of a lake, in a cabin on stilts, without any other tourists around? All alone in a country where I don’t speak the language, with no phone or access to one, and the only way back to main land is a wooden boat. A new hotel with a staff that doesn’t speak any English was going to leave me by myself at 6PM in pitch dark in a cabin at the end of the bamboo walk, with a locked door to the main house. I guess in case of an emergency, I could paddle with my foot, as the fishermen do here. But mainland is an hour by motorboat and the cold and darkness is so extreme, I would probably freeze to death. In any case, these are just thoughts running amok in my head, because no apparent danger is lurking around. In fact, this country has been one of the safest I’ve been in all my travels. Geso, the sweet girl with only a few rehearsed words of English saw the despair in my face and called her boss. He must have told her to sleep at the hotel tonight, because she turned to me with a smile after hanging up and said, “Okay, I sleep here”. In this land of fervent Buddhism, where one out of ten people is a monk or a novice, I’m going to trust that I will be okay. 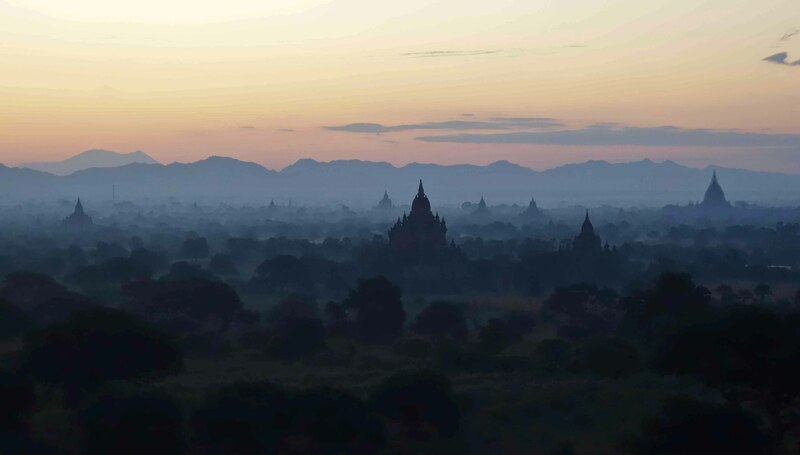 For the last week and a half, I’ve run the gamut of emotions: From the most exhilarating to the most difficult, all wrapped up in a journey through Myanmar: My first bad cold, my first vomit, my first bout with diarrhea, falling deeply for a fellow traveler, and my first balloon ride… Probably, not in that order! This country is bringing something unique to the mixture of all the other countries I’ve experienced so far. It’s a land of brave and smiling people, of incredible resilience in the face of terrible cruelty by its ruling class, of intense poverty and isolation, and presently, of a fast and furious change. And to that I would add, because it has humbled me, it has strengthened me. Win, my boat driver, picked me up this morning at 8:30AM to take me on his boat around Inle Lake. He stunk of alcohol but I was delighted it wasn’t Paan, the betel nut combination chewed in Myanmar by most men and some women, all day long making their mouth look like a flowing red river while they smile broadly. Spitting the red juice is something that must be mastered, as it’s a constant all-day chewing and spitting. Unfortunately, I’ve developed a gag reflex to the slake lime smell after having my bout with indigestion a couple of nights ago. 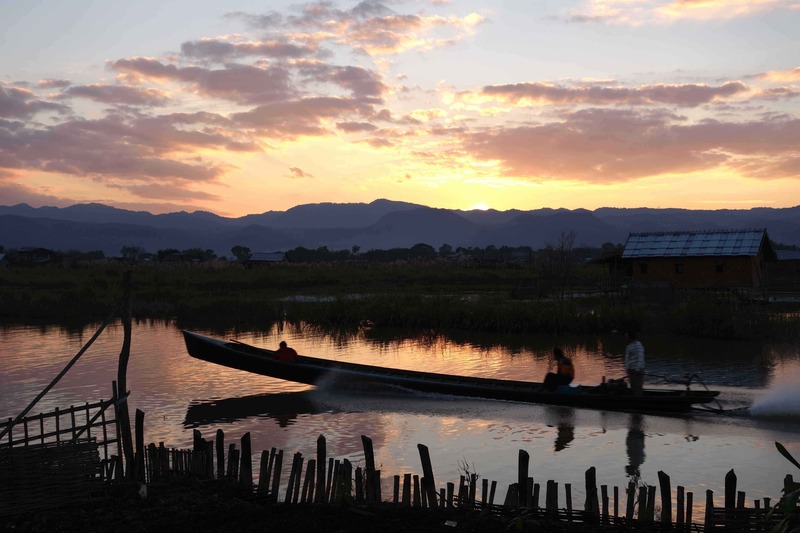 We began out of the canal in the town of Nyaungshwe on his wooden longboat. Even though I spent a couple of hours yesterday looking for an additional long sleeve shirt and blanket to use for today’s outing, I was frozen to the core wrapped with a blanket, a hat and several layers. 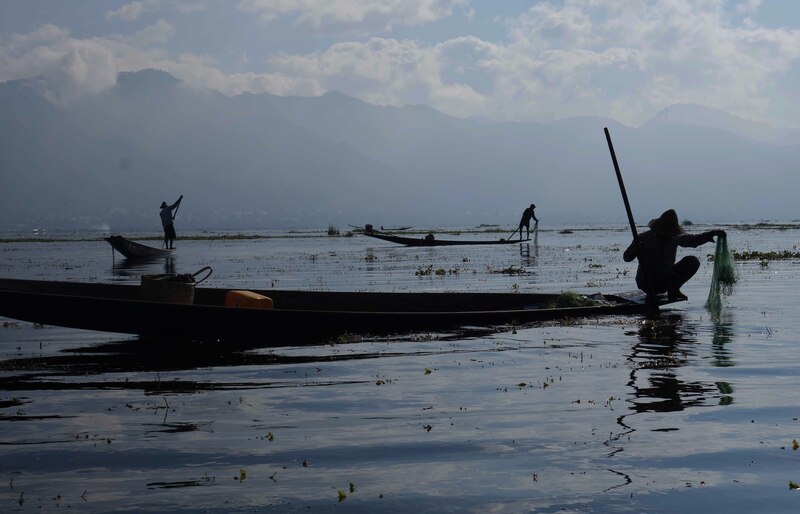 The lake has become so popular with tourists that it’s easy to feel you are being pushed from one artisan workshop to another authentic market. As with many of these tourists’ attractions in South East Asia, the interest lies outside the main focus. I’ve asked Win to see if he could include me in some of his day-to-day activities instead of cruising me along the route. 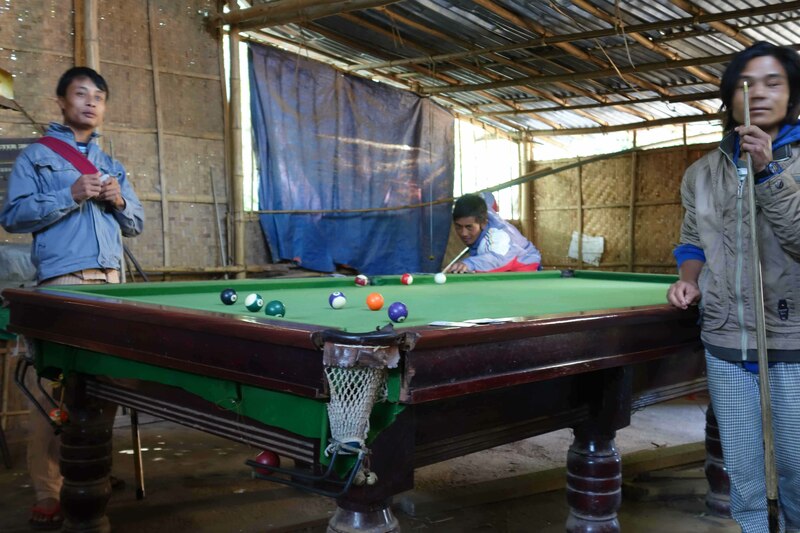 To my delight he invited me to a game of pool with his local friends and to his auntie’s house in an Intha village. A widowed mother of three living with her family selling hand rolled tobacco cigarettes. A proud and graceful family of women who were curious about me as much as I was about them, and of course wanted to know my age, why I was traveling alone, and if I had any children. My questions were not that different from theirs. I guess that as women we share that same curiosity about each other. 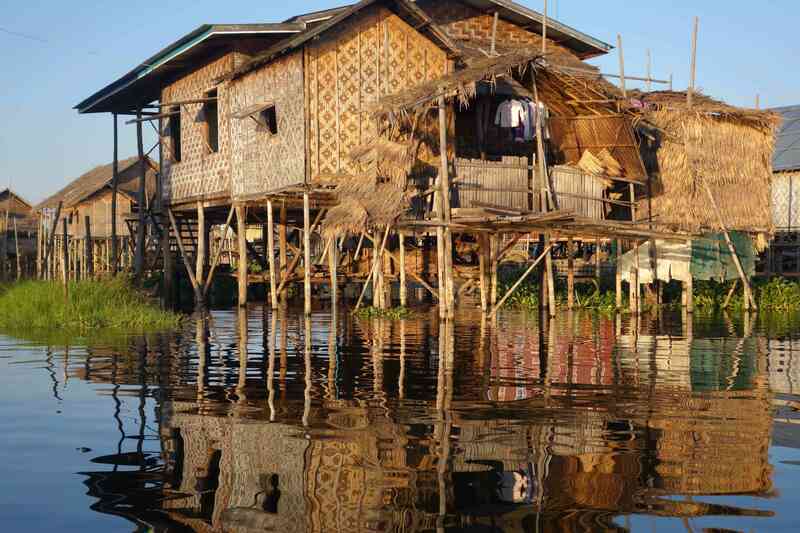 Their huts inter-connected by narrow bridges of bamboo are beautifully designed and immaculate. The main floor is made of hardwood and is a spacious room with an altar for the Buddha. A second bedroom with four floor mats neatly tucked with mosquito nets is where the family members sleep. The small wood stove kitchen is to one side of the main room. As in most tribal villages, the air circulation of the stove smoke is poor, although the bamboo walls let out smoke from open slats on top. I’m thinking of their lives as I’m lying in my wooden box with completely closed walls, under two heavy blankets and fully clothed– but still freezing! I wonder how tough it would be during the heavy rainy season when waters swell and going from place to place on a boat means getting fully soaked? How do you keep the stove wood from getting wet? How do you keep clothes from getting damp? 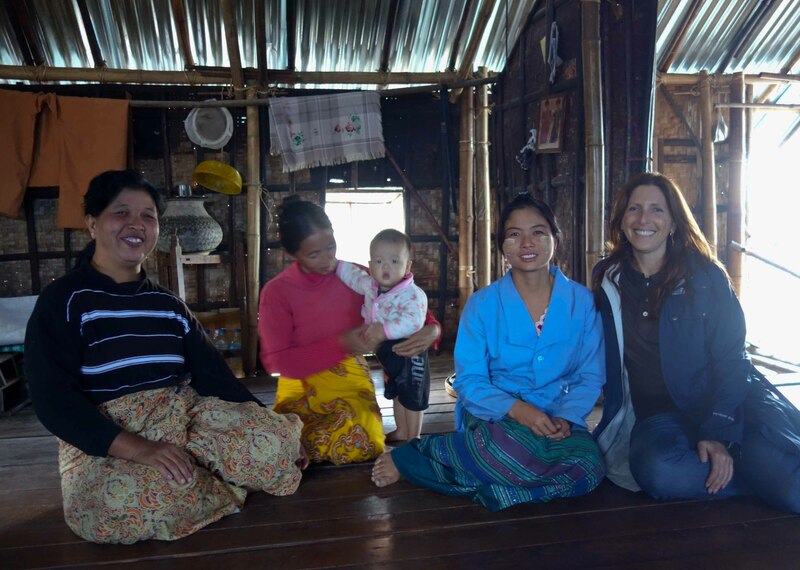 Meeting Burmese at their homes or shops, in their own environment, has been my favorite experience here. 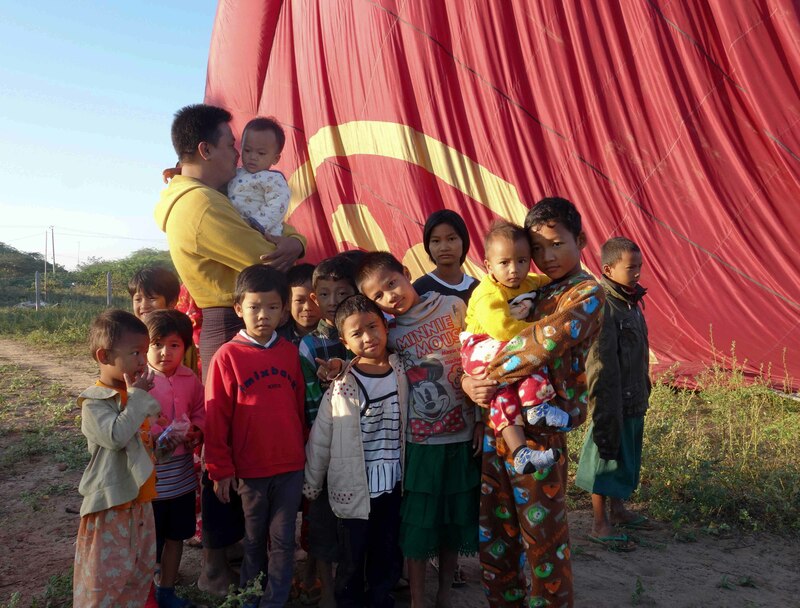 There was one time while walking in the alleys of a town near Bagan that I reached a dead end where a birthday party for a four-year-old was being celebrated. The large extended family was congregated in their dirt patio with tables and chairs and decorations set up. I was immediately welcomed and invited to sit down and share in the family’s cooked meal: Myanmar style noodle soup. The birthday boy was handsomely dressed in a maroon suit, and was fanning flies off my plate, while I fed him and myself from my soup. The whole family was watching and smiling. A Spider-Man cake with more candles than 4 was set on a table waiting for me to finish the meal and begin singing happy birthday in English. 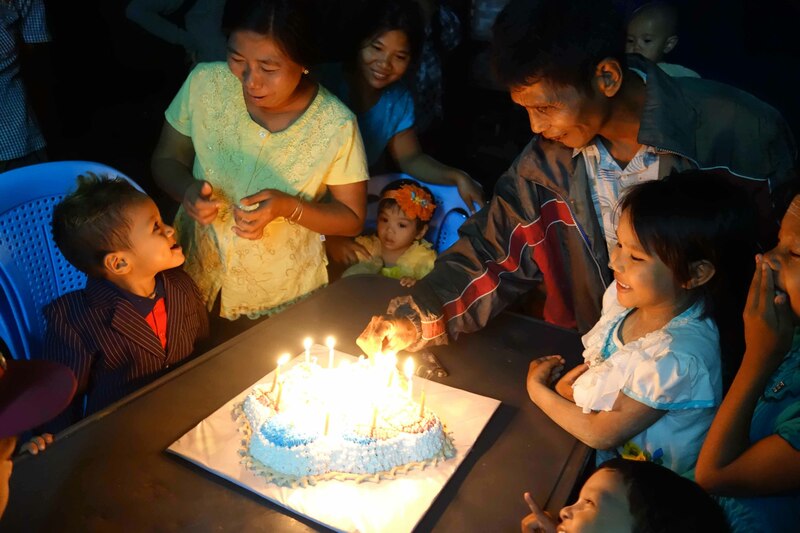 None of the members of the family spoke any English, but they could sing happy birthday! Or while driving with a friend and his driver through the back roads towards Pyay, I was eager to practice my Burmese skills when we stopped for water. As I entered the simple bamboo establishment with plastic tables and chairs, I practically ran to this girl and blurted my request. She was so taken by my interest that she proceeded to try to teach me some Burmese, at which I miserably failed creating lovely laughter amongst her mother and sisters, who were all there attending the shop. Or when I stood on the road next to girls and women, dancing and smiling to the music blurting from speakers as they held silver bowls waiting for cars, ox-carts, and beat up trucks, or passersby to donate to the monks. Saturday and Sunday are days for accepting donations. Or when curiosity took the best of two middle aged women. 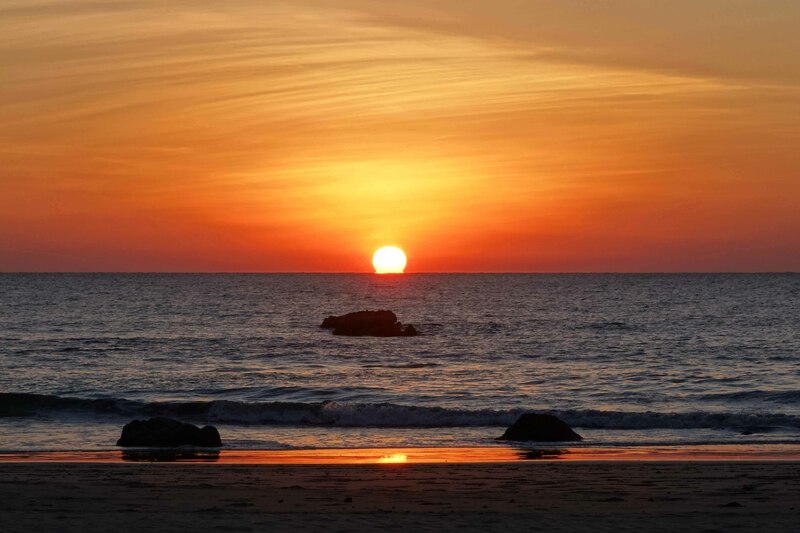 Staying at a beach in the incredibly beautiful Bay of Bengal, wearing a conservative bathing suit I walked across the water and was surprised to feel soft caresses on my backside. I turned around and saw two women smiling and caressing my white legs in awe. I smiled back knowing that their interest lay in my white skin and red hair. So different than theirs that they needed to touch it to see how it felt. Their genuine gesture of interest was moving. Or while visiting Mingun near Mandalay, a monk invited me to share with him Myanmar tea with cookies, and a green plum used for curving the appetite of monks during their afternoon and evening fast. Monks eat early breakfast at 5AM, and then leave the monastery for alms around 10AM for their last meal of the day. 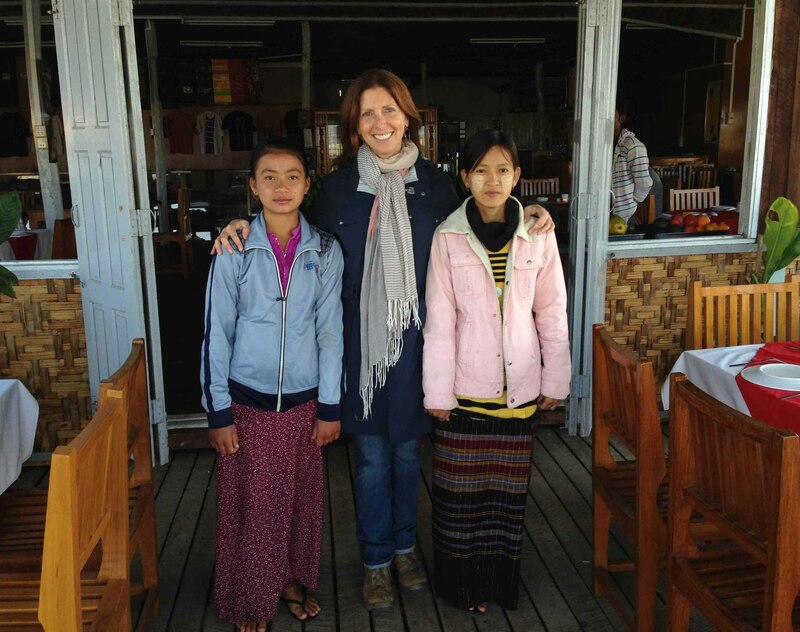 In Myanmar there are many young novices, ages 7 and up who for the most part are orphans. In some cases only one of their parents has passed away, but the other cannot take care of them and the child is sent to a monastery. No language skills were necessary for these encounters, just a plain desire for an honest and real connection. It was a gentle reminder of our common humanity. I’m saddened to think that a few years from now people will change. The income of tourists coming will double, even triple. 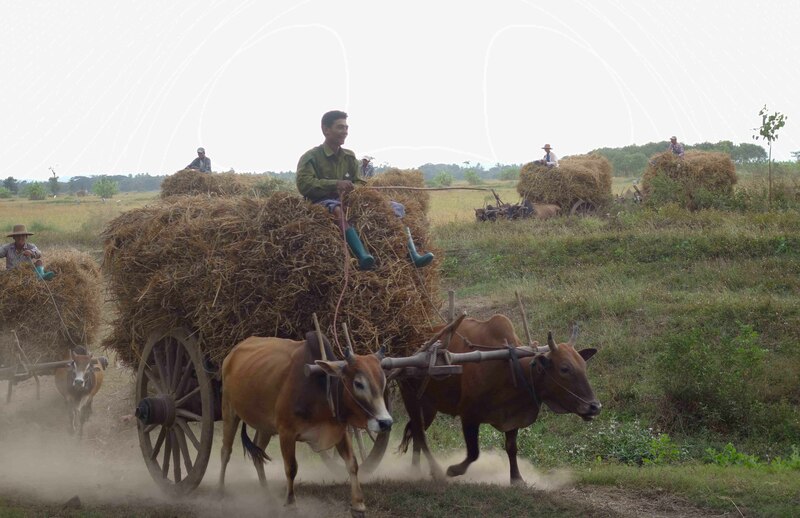 With that influx, the Myanmar people, who are very poor and have been isolated for so long, will also see profit down the line and will begin to cater more and more to foreigners, leaving behind some of their remarkably open and friendly spirit. 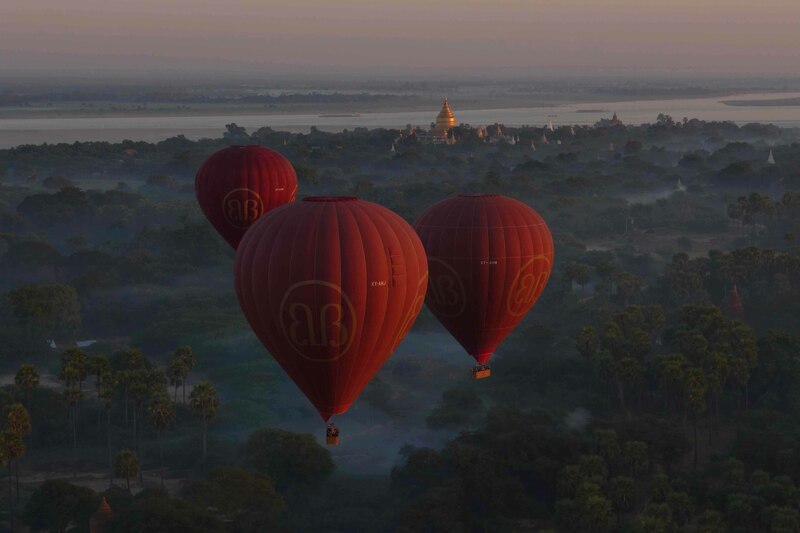 But for now I will lay in my bed under the two blankets dreaming of the balloon ride over beautiful Bagan, a city of miraculous pagodas, developed between the 11th and 13th century, and spreading as far as the eye can see. It’s a magnificent site, both from below and above. But only from above can you appreciate the size and full breadth of the pagodas. The morning fog gives the scene an element of magic, which might not make you feel like a 12th century monk… but more as a bird set free.